3nine introduces a highly effective screw action oil skimmer to the European and North American market through a collaboration with the Japanese company RIX. The new screw action oil skimmer separates out more than twice as much tramp oil per hour than a traditional belt skimmer, resulting in an increased life expectancy of cutting fluid and machinery as well as a better working environment. Tramp oil is one of the most significant causes of quality deterioration in cutting fluids as well as reduced machine tolerances. If the tramp oil is not constantly separated out the cutting fluid must be continuously replaced, which will involve significant long-term costs. Tramp oil also contributes to bacterial growth in the cutting fluid that is then spread by airborne fluid particles. This can result in allergic reactions and is also a source of foul odors in the workshop environment. The technique exploits the viscosity differential between oil and cutting fluid, with the more viscous oil clinging to a rotating threaded device, from where it is separated out. With the screw action oil skimmer you can separate 126% more tramp oil per hour than with a traditional belt skimmer without removing scarcely any cutting fluid. * This new way of separating tramp oil is highly effective, gives you minimal loss of cutting fluids, has low maintenance requirements, low operating costs as well as a compact design. The technique is developed by the Japanese company RIX in response to a request from a world-leading automotive company and has become the standard solution in Japanese factories. 3nine has now started a collaboration with RIX to sell the oil skimmer in Europe and the US. * Results of a test carried out for 6 hours in the factories of one of the largest Japanese automobile manufacturer. RIX, a Japanese corporation that has its head office in Fukuoka, is primarily active in the development of rotary joints and oil skimmers. 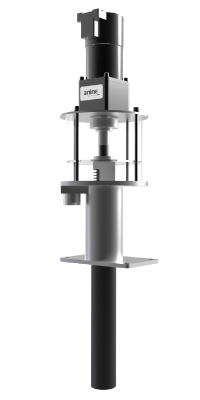 In 2016, 3nine and RIX initiated a collaboration with the aim of selling oil skimmers in Europe and the US under the joint name of 3nine RIX Oil Skimmer.